“Casablanca” will be shown at Beykoz Kundura on Feb. 15 and Feb. 17. Kundura Cinema located in the boiler room of the old Beykoz Shoe Factory, is offering viewers a cinematic journey with its special selection of films for Valentine's Day as part of this month's program. All movie lovers are invited to Kundura Cinema Feb. 14-17 to watch unforgettable classics on the silver screen in the historical atmosphere of the old factory. "Casablanca" the unforgettable classic by Michael Curtiz, made in 1942, tells the story of Europeans who fled Hitler and took refuge in the town of Casablanca in Morocco during World War II. The movie is about the hero Rick Blaine's encounter with his former lover Ilsa and her resistance-leader husband Victor Laszlo. Rick is the only one who can ensure that Ilsa and Victor escape from the city. 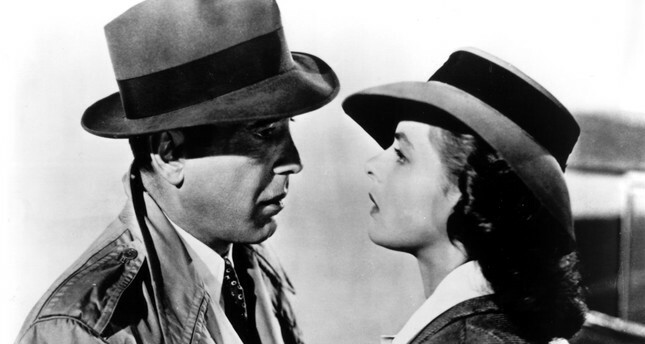 Viewers can watch "Casablanca" on Feb. 15 and Feb. 17. "An Affair to Remember," made in 1957 and directed by Leo McCarey is about the breathtaking love story of Nickie Ferrante and jazz artist Terry McKay. They prove their love for each other by meeting on the roof of the famous New York skyscraper, the Empire State Building. The movie will be screened on Feb. 16 and Feb. 17. William Wyler's 1953 movie "Roman Holiday," deemed as one of the fun films of that time period, is based around the adventures of modern time princess Ann in Rome. "Roman Holiday," which won Audrey Hepburn an Academy Award for Best Actress, tells the story of Ann, who sets out to explore Rome, and Joe, who disguises his identity as a journalist. The film will be screened on Feb. 14 and Feb. 16.